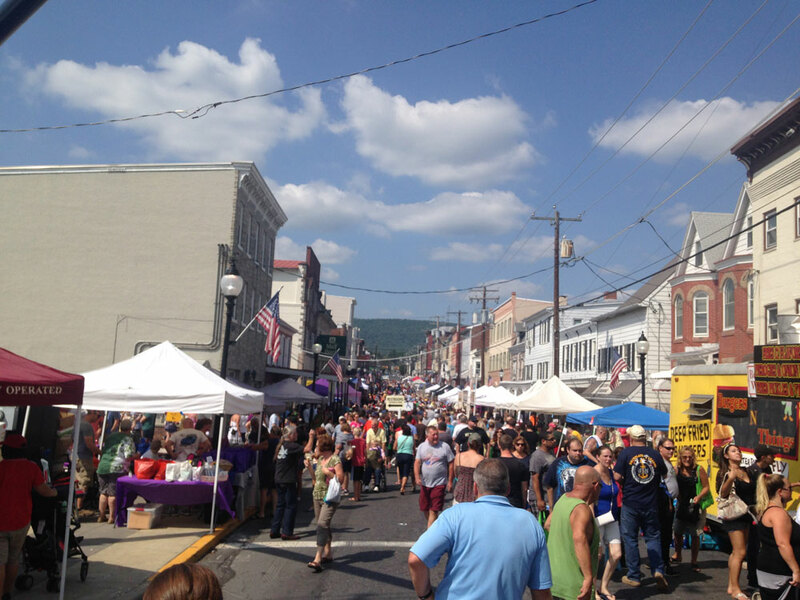 Of all the food festivals in Berks County, none are bigger than the Taste of Hamburg-er. Every September, tens of thousands of hungry people descend upon Hamburg for a taste of its namesake dish. But the timing was never right for me, and for 11 years, life got in the way of my attending. I wasn’t going to let anything stop me from attending this year. September 5 had been circled on my calendar since last fall, and I was going no matter what. The festival opened at 10 a.m., but we decided to take our chances and wait out the lunchtime rush. At about 1:30, we pulled into the parking lot of Hamburg High School and waited for our shuttle bus to carry us to the festival in the town below. After a quick stop at the Hamburg Field House, we were delivered to the festival and the throngs of people who packed the streets. I did a little research ahead of time, but I was no closer to making a decision as we started our walk along Fourth Street. We passed the deep-fried burgers at Ray’s Catering, the bacon cheeseburgers from Scout Troop #184 and incredible selection from the Penn Werner Hotel (Oscar burgers, Baja burgers, mac and cheese burgers, to name a few). I was surprised to also see CC’s Wooden Grill, the former Kutztown restaurant that closed more than a year ago, set up as well. Making a left onto State Street, we saw the Weis Markets stand. Nothing against Weis Markets—we do most of our grocery shopping there—but there was no way that I would choose them over the 33 other stands. We continued along State passed the Hometown Restaurant and Catering stand with half-pound burgers on pretzel rolls. We also passed Hecky’s Sub Shop, which was business as usual, attracting patrons with the promise of air conditioning. After skipping the Leesport Lodge and the Inn of Orwigsburg, I found the burger of my dreams. 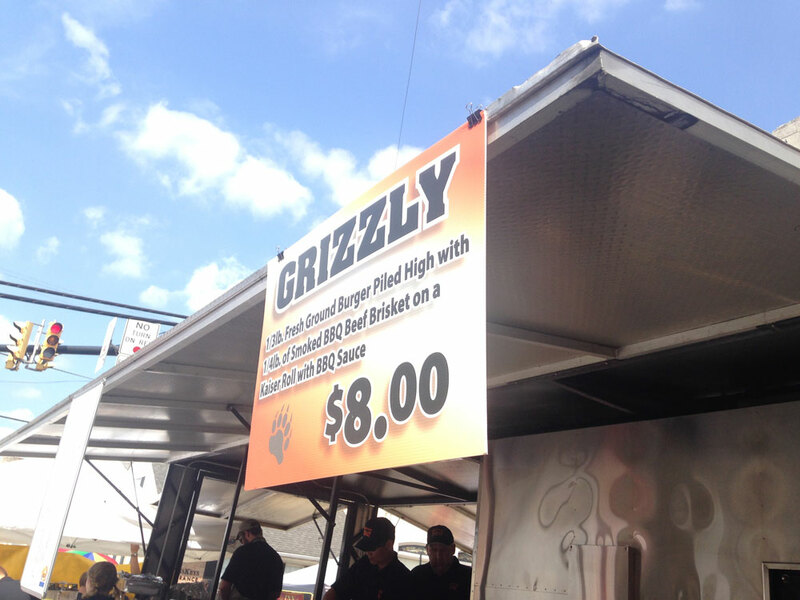 The Grizzly is aptly named because it would comfortably feed a bear. 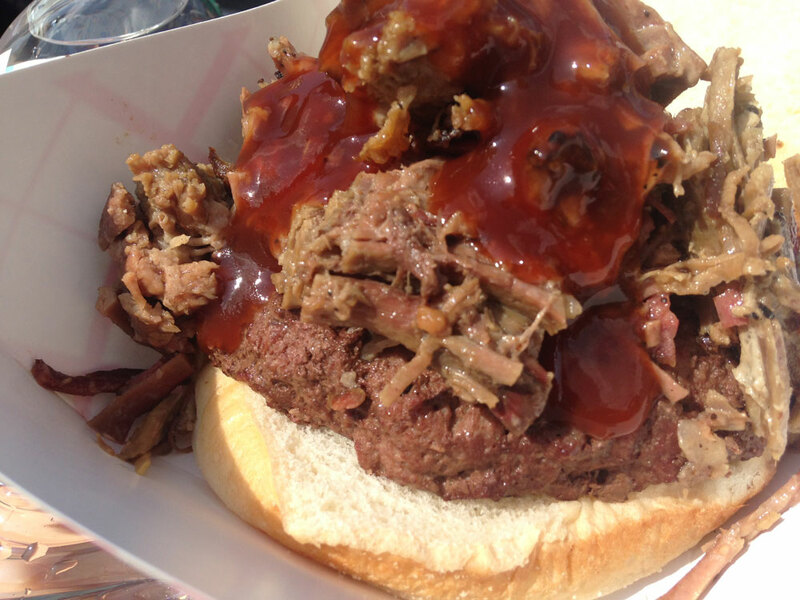 They take a one-third pound beef patty and throw a quarter-pound of brisket on top and serve it on a Kaiser roll. It’s simple, but it works. The brisket was perfectly tender. The burger was juicy. Both had that great smoky flavor I love in my barbecue, and together they made a perfect lunch. We hung a right on Third Street to find something for Julie. The line for the Deitsch Eck was a little too long (with options like The Luther—a bacon cheeseburger on a glazed donut—I’m not surprised) so we continued on past Uncle Paul’s Stuffed Pretzels to the Chowhound Wagon. I don’t know if this was left intentionally vague, but those five words don’t do justice to what the Chowhound had to offer. The food truck had six gourmet burgers, all made with Angus beef, or a build-your-own option with your choice of beef, turkey, veggie, bison, Wagyu or lamb. 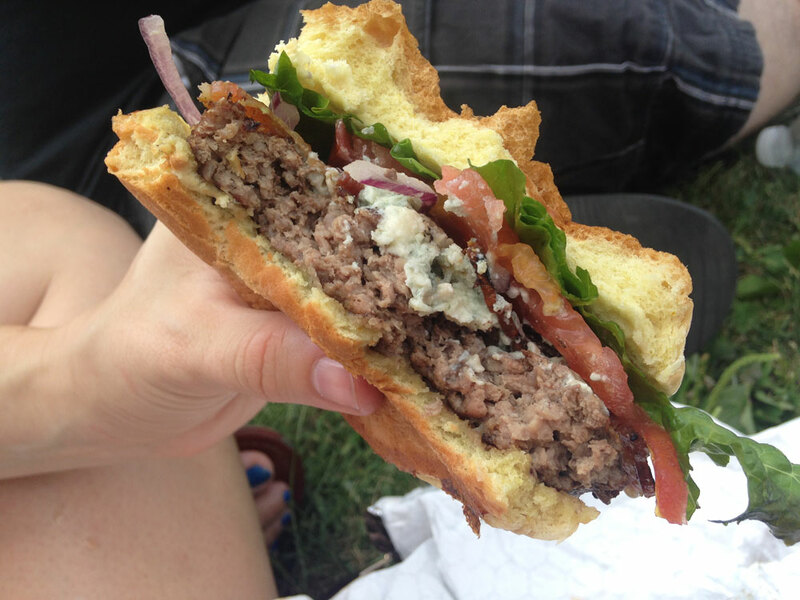 Julie played it safe with the “Elvis Got the Blues” burger, topped with Maytag blue cheese and apple-smoked bacon. After one bite, Julie was hooked. 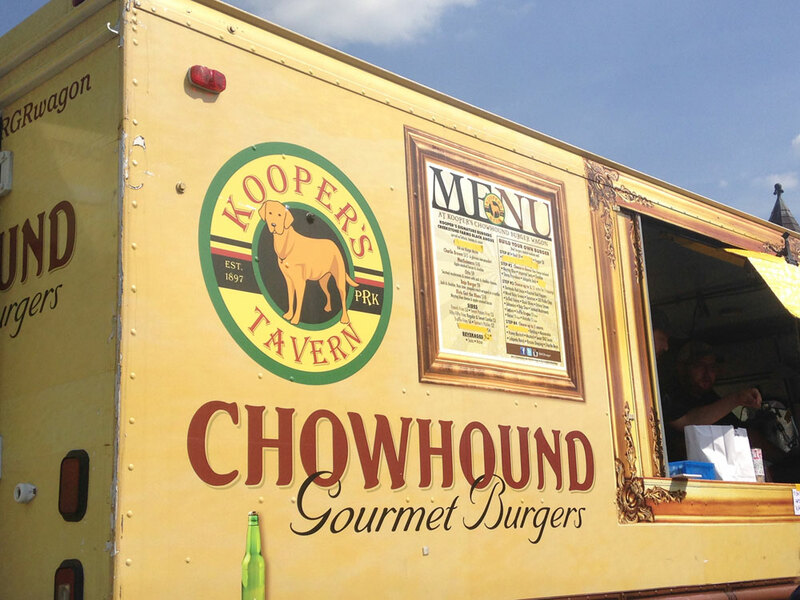 As for the fries, Chowhound offered four options: French fries, sweet potato fries, fifty-fifty fries (half regular, half sweet potato) and truffle fries. It didn’t take much convincing by me to talk her into an order of the truffle fries. They were delicious. 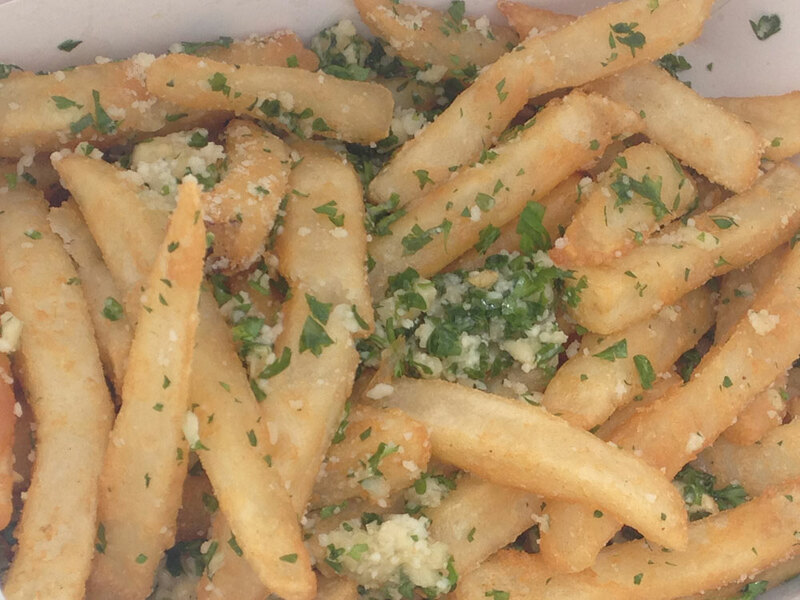 Truffle oil makes everything better, but I absolutely love it on French fries. But the addition of the garlic and parsley just made these perfect. We both left with garlic breath, but it was well-worth it. Somehow after all of that, we still had room for dessert. We had hoped to grab a seat at the soda fountain at Adams and Bright Drugs on State Street, but everyone else seemed to have the same idea. Thankfully, one of our favorite mobile stands, the Perk Up Truck, was there to provide cool relief from the 90-degree heat. 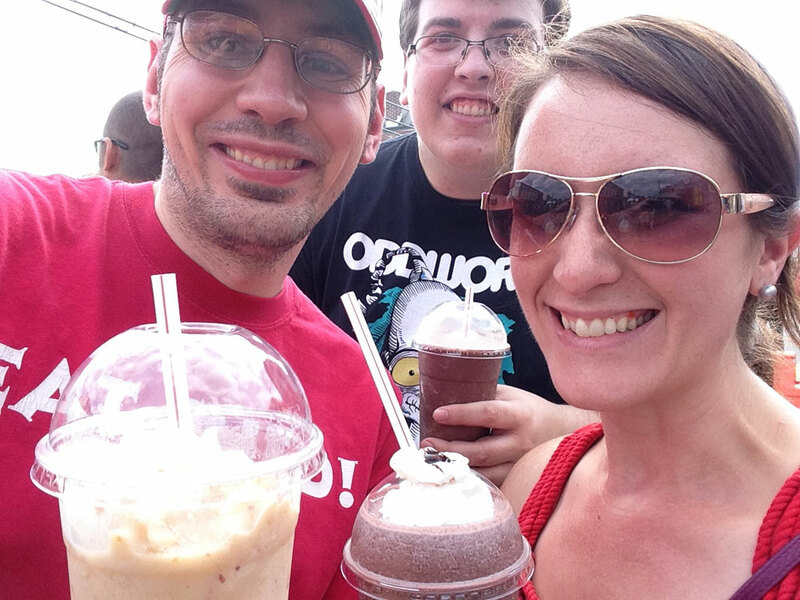 We each grabbed a smoothie: fresh peach for me, frozen strawberry hot chocolate for Julie. The only problem with the festival is also it’s greatest strength. 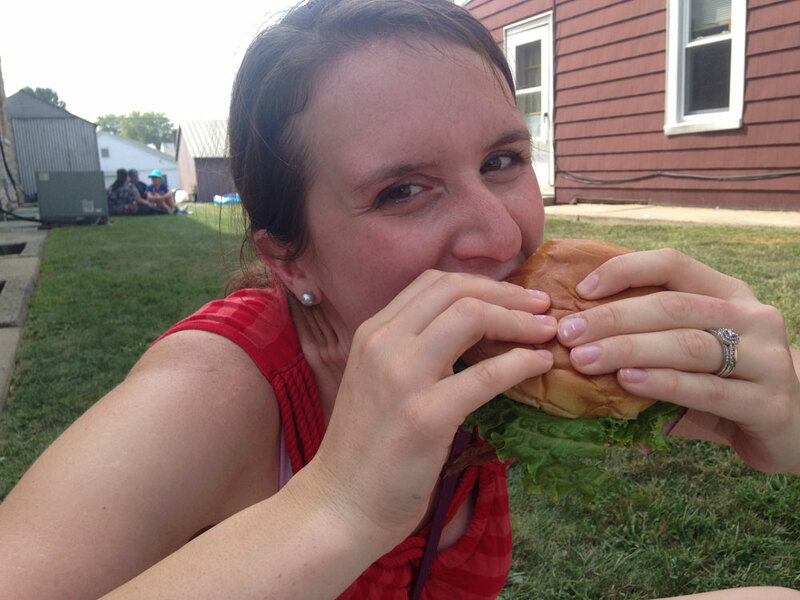 All of the participants are bringing their biggest, most creative burgers to the event. Even without the fries and smoothie, I would not have been able to force a second burger. That meant passing on things like Gourmand’s Berks Burgers (with Lebanon bologna, cream cheese, apple butter and Good’s potato chips), Smokin’ Bull Shack’s loaded burger (cheese, pulled pork, BBQ sauce, pastrami, baked beans, coleslaw and onion rings) and Spuds‘ surf and turf burger (crab meat, lettuce, tomato and Chesapeake mayo). If only I had three stomachs and a full day to try all of them. Still, I left with no regrets about my choices. And after trekking back up the hill to my car, I didn’t feel the least bit guilty about my choices.